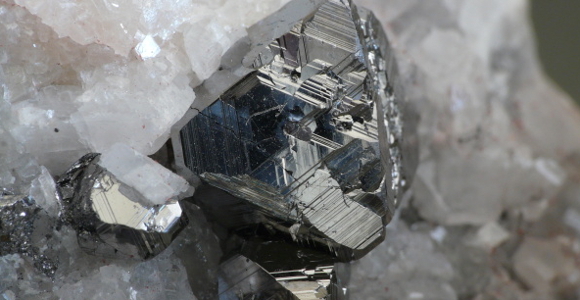 Carrollite, a cobalt sulfide mineral mined in Congo. *Image courtesy of Geowiki. 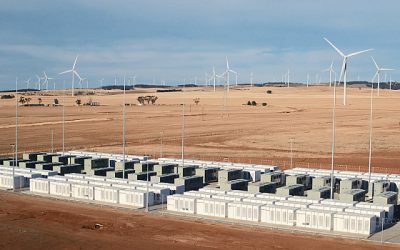 The global battery market is booming. Car makers all over the world are pledging to electrify their fleets completely or to a large extent in the coming years. Battery-powered consumer electronics – laptops, tablets and smart phones – are more popular and affordable than ever. And stationary energy storage is on the rise to serve the increasing need for flexibility in energy systems around the world, among others. As a result, we expect global battery demand to increase fivefold from ~100 GWh today to ~500 GWh by 2025 (see figure 1 below). Lithium-ion batteries rely on diverse cathode chemistries, such as lithium iron phosphate (LFP), lithium manganese oxide (LMO), lithium cobalt oxide (LCO), lithium nickel cobalt aluminum oxide (NCA) and lithium nickel manganese cobalt oxide (NMC). As chemistries based on nickel and cobalt typically feature superior energy density, LCO, NCA and NMC are the preferred choices for mobile applications. While LCO is mainly used for portable electronics, NCA and NMC are key to the e-mobility sector’s ongoing quest for longer driving ranges. Looking at the supply side, the world’s cobalt resources are plentiful – according to the U.S. Geological Survey (USGS), they amount to about 25M metric tons. To put this number in context: this would be enough to satisfy the world’s current annual cobalt demand of around 105k metric tons for about 250 years. 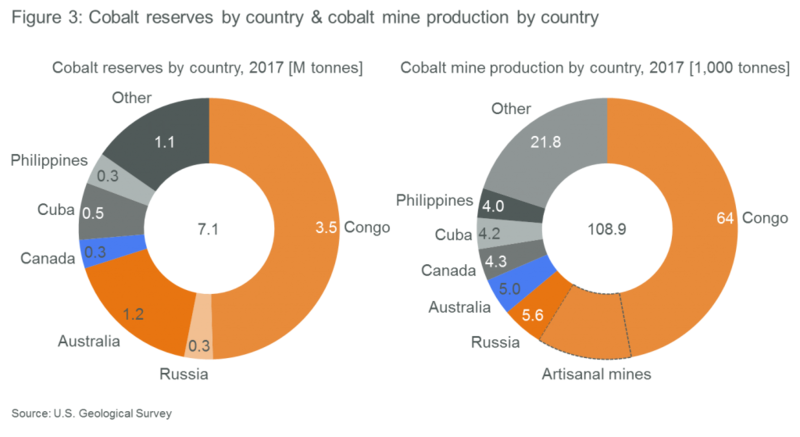 Current global cobalt reserves, i.e., resources that can be economically extracted at current cost and prices, are obviously lower and estimated at about 7M metric tons (USGS). But reserve estimates should not be seen as a static figure: With rising demand for a raw material, prices typically go up, leading to a growing portion of resources that can be economically mined and are therefore “turned” into reserves. Also, exploration for new deposits of the mineral usually goes up as well, often leading to new sources of supply eventually. All in all, there seems to be enough cobalt to meet demand for the foreseeable future. However, there are two key issues that exhibit significant potential to create supply bottlenecks, related to the nature and the location of cobalt deposits. The second, probably even bigger issue is that the majority of the world’s cobalt resources and reserves are located in the Democratic Republic of Congo (DRC). Almost two thirds of the global cobalt mine output of ~110k metric tons in 2017 originated from the DRC, as a by-product of local copper production (see figure 3). This is a problem on many levels as the DRC is plagued by corruption, low political stability and high geopolitical risk – it’s not without reason that it ranks 182nd (out of 190 countries) in the World Bank’s ease of doing business ranking. Things are unlikely to improve soon. In contrast, many see the country on the brink of a new civil war, as elections originally planned for 2016 are delayed again and again. In this already shaky business environment, the high concentration of supply paired with increasing demand leads to a growing market power with unpredictable impacts on the sourcing conditions for cobalt. In fact, the Congolese parliament just approved a new mining law in late January 2018, increasing royalty rates on “strategic” metals – including cobalt – from the current 2% to 10%. The new rates would be “immediately applicable to all holders of mining rights valid”, suspending the previously applicable 10-year grace (or “stabilization”) period for mining companies before they have to comply with any legal or fiscal changes. The consequent lack of regulatory certainty will make mining activities in the country even more risky than they were in the past. Illegal rent-seeking activities are already endemic and expected to intensify further. Lack of economic and political stability is only one factor that makes sourcing cobalt from the DRC problematic. Sustainability is the other. Around one fifth of the DRC’s cobalt production comes from so-called artisanal mines, where workers – many of them children – use hand tools to laboriously dig. Labor conditions are horrendous and pose severe risks to the workers’ health and safety. As Congolese militias are often being financed through revenues from these mines, it is likely that cobalt will be considered a “conflict mineral” soon. This is a big problem for cobalt consuming industries such as e-mobility and energy storage, which pride themselves on being green and sustainable. And as public scrutiny of supply chains will increase as the industry matures, companies that fail to comply with minimum ethics standards will likely experience adverse business impacts. All in all, the issues mentioned above may contribute to a situation of increasingly tense cobalt supply despite the abundance of cobalt resources. The market was already in deficit last year, causing cobalt prices to more than double to USD 75,000 per metric ton in the course of 2017. The re-start of large idled mines, such as Glencore’s Katanga mine in the DRC, is expected to alleviate pressures in the near future: The mine’s cobalt output could reach 11k tons this year and 34k tons in 2019 (compared to ~100k metric tons of total cobalt supply in 2017). But this relief will not last long. 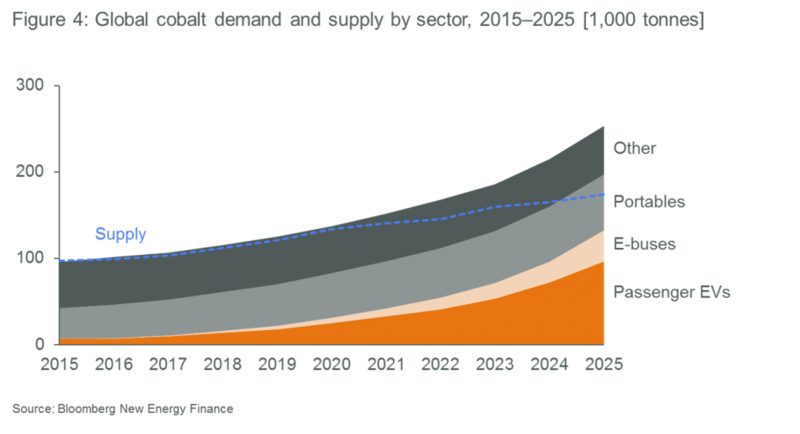 Demand for cobalt in particular from the electric vehicle industry will continue to surge, prompting research firm Bloomberg New Energy Finance to predict a notable supply shortage by 2025 (see figure 4). Alongside the attempt to improve the performance of non-lithium-ion systems, such as sodium-ion batteries, there is a general trend towards the use of cathodes with lower cobalt content. Rather than switching to a new chemistry (e.g., from LCO to NMC), this is about adjusting the share of cobalt within the cathode. For example, NMC batteries traditionally contain nickel, manganese and cobalt in a 1-1-1 ratio (therefore called NMC 111). This translates into a 13% material share of cobalt for the battery. The trend is slowly shifting towards NMC 532 or NMC 622 batteries with a cobalt content of 8% and 7% respectively. 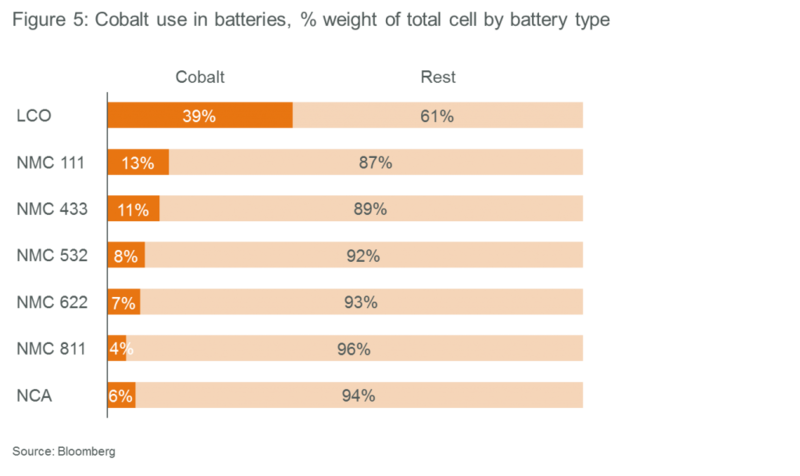 In the future, the share of cobalt will be further reduced to around 4%, as automakers move towards NMC 811 batteries (see figure 5). Obviously, the target of reducing the reliance on cobalt needs to be carefully balanced with the impact on performance – with negative as well as positive effects – for the particular application. On the supply side, increased recycling of cobalt would help reduce dependency on unreliable or unstable cobalt sources. Presently, secondary cobalt is recovered mainly from metal scrap through a smelter process. Given the growing share of cobalt used for energy storage, it should also be in the interest of the related industry players to help establish a recycling chain for battery materials and thereby increase supply. Already today, there is a vast amount of cobalt that could be recycled from consumer electronic devices if more suitable collection schemes would be in place. With regard to electric vehicle batteries, some first signs of action have become visible. The European Commission, for example, recently signed an innovation deal to tackle whether regulation is conducive to efficient recycling of EV batteries. In China, the Ministry of Industry and Information Technology (MIIT) has already issued “interim” rules that hold carmakers responsible for setting up facilities to collect and recycle spent batteries. Widespread recycling, however, depends on a critical mass of batteries reaching their end of life, typically after 5–10 years. Given that the e‑mobility boom is just emerging, significant amounts of secondary cobalt from this source will only become available in the mid- to long-term. 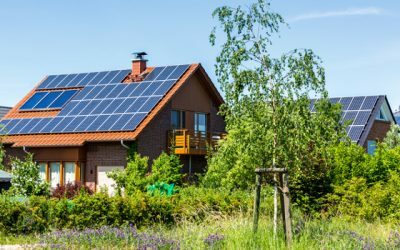 Should there be widespread application of second-life batteries, this time frame would be shifted further back – although the impact would then be offset, to a certain extent, by the lower demand for new batteries. Last but not least for a more sustainable supply, supply chain transparency and traceability need to be improved. Some companies are already making progress on this matter, others are still lagging behind. A report published by Amnesty International (AI) late last year, for example, found that Apple and Samsung SDI are already taking adequate actions to make their cobalt supply chains more sustainable – although more could still be done according to AI. Among the carmakers, BMW and Tesla were found to have made the most progress. These companies are also members of the Responsible Cobalt Initiative (RCI), launched in late 2016 by the the Chinese Chamber of Commerce of Metals, Minerals & Chemicals Importers & Exporters (CCCMC), supported by the OECD. The RCI aims to reduce risks along the cobalt supply chain and to increase supply chain transparency. In addition to industry initiatives, technological innovation might also help: BMW is reportedly working with London-based start-up Circulor on the implementation of a blockchain-based pilot scheme that tracks the journey of “clean” cobalt from countries such as e.g., Australia or Canada along the supply chain. Another blockchain-based pilot project for cobalt tracking will be launched in the DRC this year, according to Reuters, hoping to give manufacturers a tool to prove that the cobalt used in production was not mined by children. If they work, these schemes could become essential pillars of the battery industry’s quest for better supply chain transparency and traceability. For questions or comments, please contact Apricum Partner Florian Mayr. 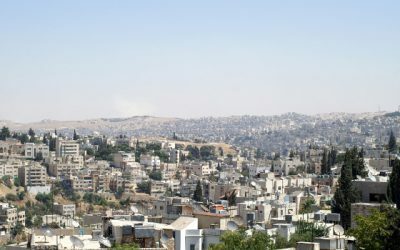 The MENA region – the next hot market for energy storage? 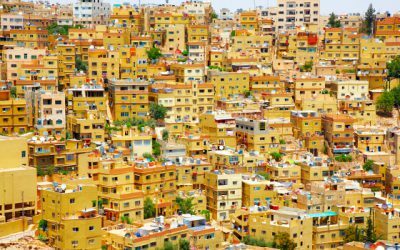 Webinar: Is MENA the next hot market for energy storage? 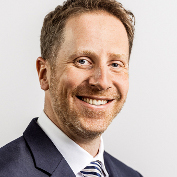 Florian Mayr is an expert for strategy, business development and transaction advisory in the global renewable energy markets, including energy storage. Florian leads Apricum’s energy storage practice and is responsible for the company’s international activities in this field. 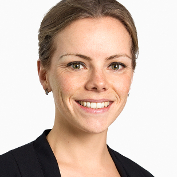 Stephanie Adam has significant expertise in the German energy storage market and works on strategy projects as a member of Apricum’s energy storage practice. She is an expert on business model development, with extensive industry experience in electric vehicles, grid integration of renewable energy and distributed generation.